Researchers developed a new digital stethoscope that combines precision sensors, electrocardiogram technology and machine learning applications into one piece of equipment to better detect heart ailments and problems that might occur with an implanted heart pump. 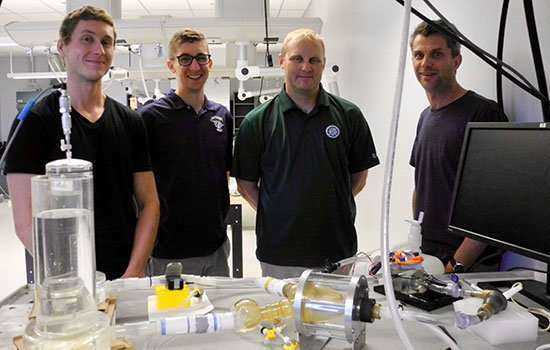 Jason Kolodziej and Steven Day, engineering professors at Rochester Institute of Technology, worked with Dr. Karl Schwarz, cardiologist and professor of medicine at the University of Rochester Medical Center, to develop an Advanced Digital Stethoscope prototype. The researchers expanded capabilities and functions of a traditional stethoscope to detect off-rhythms of the heart, primarily one with an embedded left ventricular assist device, or heart pump. Left ventricular assist devices (LVAD) are used to help manage end-stage heart failure, pumping blood from the left ventricle to the aorta to provide needed blood flow for patients with severely reduced heart function. The research team determined that natural heart sounds and the sounds of the implanted LVAD may hold the key to diagnosing patients with suspected device dysfunction. "This stethoscope that we designed integrates multiple sensors into one. It is not necessarily a new sensor that measures something never measured before; it is something that in a hospital setting would be done by multiple machines. Most cardiologists aren't wheeling around this data collection hardware," said Kolodziej, associate professor of mechanical engineering in RIT's Kate Gleason College of Engineering. Cardiovascular disease is one of the leading causes of death in the U.S. with more than 600,000 dying of heart disease annually, according to the Center for Disease Control. Diagnosis of the disease entails performing several important tests and assessments including ECG, echocardiograms, x-rays and cardiac magnetic resonance imaging, for example. Acoustic information through a stethoscope is also one means to attain information about heart function. Stethoscope design has changed little since its invention in 1816 by Rene Laennec. Schwarz, director of the URMC's Echocardiography Laboratory, performs routine imaging and advanced imaging studies on patients with complex cardiac disease and of patients with mechanical assist devices. The RIT and URMC researchers proposed modernizing a stethoscope design and worked to develop a prototype using innovative digital signal processing techniques, including digital signal filtering, advanced beat-based rejection algorithms and ensemble averaging. The new design includes a microphone for recording data collected through the stethoscope, combined with ECG leads—stainless steel contact pads that would normally be affixed to a patient's chest, arms and legs. Usually the ECG leads are part of a separate piece of equipment standard in acquiring digital audio of heart sounds. Instead, researchers attached them to the new stethoscope head. The new leads were 3-D-printed at The Construct, an RIT laboratory. Apart from hardware for the project, computer algorithms—also referred to as machine learning techniques—are incorporated into the larger system to take in signals, and to learn and recognize defects. Techniques to improve acoustic diagnostics include spectral analysis, advanced automated neural networks and a combination of smartphone-based, interactive software that will allow the clinician to make a diagnosis when integrating the advanced acoustic analyses with other routine clinical information. Improvements to digital stethoscopes provide more information in the acoustic signature than is normally being used, and having been trained to listen for different things, physicians hear signals such as heart murmurs, valve regurgitation and other signals that indicate different defects, Day explained further. "It is almost unconscious, like people listening to engines, and hear something off that could mean a problem. But if you ask what sounds different, they may not be able to explain it or articulate it, but they just know. This is about getting the device to do that, to hear sounds and then to make that determination of what the problem could be," said Day, a professor and head of RIT's biomedical engineering program. He also has vast experience in the development of LVADs, building a state-of-the-art implantable blood pump with peers from the University of Virginia, the Utah Artificial Heart Institute and MedQuest Inc.
Are stethoscopes a timeless tool or an outdated relic?